I feel very adult this week. We bought a crib and we made an offer on another house and our health care got more complicated and expensive and I'm trying to read books about birth without my chest tightening so much I feel faint and that quote makes me feel better about the normality of all this. There is a beautiful mess in the figuring out of things. I'm scared. About everything, and mostly without reason, but when I do get stressed, I can typically trace it back to fear. Fear of failing, of loosing or of being in pain. My dad met with me a few nights back so I could show him my numbers for our potential house purchase and he could confirm it was a good idea... at least on paper. I think I just wanted his blessing for the biggest purchase of our lives, even if this whole thing doesn't go through. I get a lot of my worry tendencies from my dad, and it felt nice to have someone of like mind, 30 years ahead in this game, tell me it was going to be OK. Maybe we'll have super tight months or there will be a huge leak in the floor or our new neighbor will be creepy or maybe this will be the house we slowly make ours and grow old in, but no matter how the story goes, it will all be OK. How come that is so easy to overlook? Today, I will believe it. A sweet mom-to-be asked me for a few suggestions on freezer meals she could prepare in advance while waiting for her wee one to arrive. I realized that while clicking through our site, I don't have many options. A good handful of breakfast baked goods that could freeze well, but a limited amount of stone cold meals as I look back. I had a pretty good response to the lentil meatballs from years ago which also made it into the last cookbook, so I figured I'd try something similar to that. In the same way I make my veggie patties, I start with nearly a 1:1 ratio of cooked grains and legumes (in this case, brown rice and lentils) and then I build from there. Always garlic. Usually onion, either raw or cooked. I use egg to help bind here, but I'll often use cheese for binding power as well. 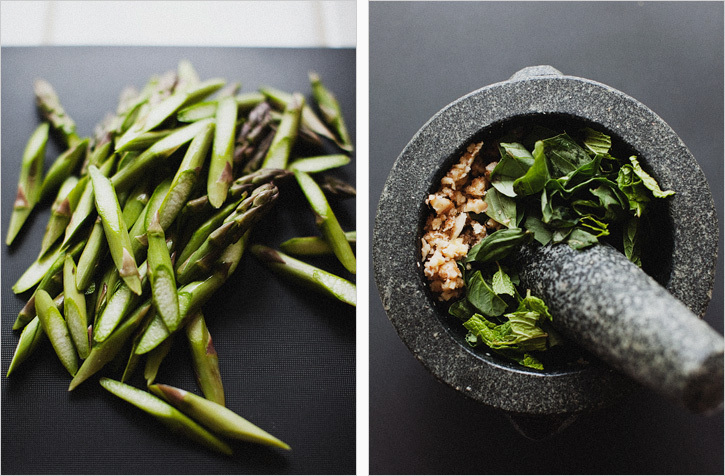 I blitz in a ton of herbs, a cooked vegetable and bold spices and flavor to doctor them up. For this Asian nugget, I went with soy sauce, sesame seeds and chili sauce. Miso would be great in there too but I wanted to save that for the sauce. 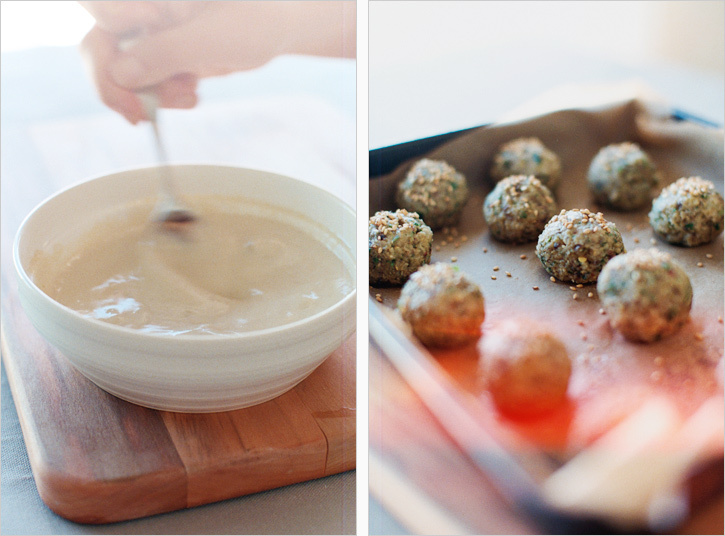 All veggie balls need a good sauce. A veggie ball is really only good with a sauce, if you ask me, but I think you could put them along with anything that sounds good to you. The Asian nuggets can be completely cooled and frozen in plastic bags until needed. I got about 26 nuggets. This just leaves you with needing to prepare veggies and sauce which could be whipped up in 15 minutes. As for substitutes, I think you may be able to replace the egg with flax meal and a little water but they may come out a little drier. To keep them gluten free, replace the panko with a coarse oat flour but note they will be more delicate to work with. If going the GF route, I would try to keep the egg in, if possible, to keep everything together. Preheat the oven to 375'. Line a baking sheet with parchment. In a food processor, combine the garlic, onion, eggs, sesame oil, tamari or soy sauce and chili paste and pulse a few times until the onion and garlic are well chopped. Add the rice, lentils, panko, cilantro, pinch of salt and pulse a few more times until just combined. You want to still distinguish nubs of rice, but it should look pasty enough that you could roll it in a ball. Let the mix sit for ten minutes. Roll the dough into 2'' balls and line them up on the baking sheet. Brush them with a thin coat of oil and sprinkle them with sesame seeds. Bake on the middle rack for 15-18 minutes until browned and dry on the outsides. For the veggies, in a large skillet, heat the sesame oil. Add the green onions, mushrooms and a pinch salt and saute for 4-5 minutes until just softened. Roughly chop the broccoli and add it to the pan along with a splash of rice vinegar and saute another 5-10 minutes until softened to your taste. For the sauce, whisk all ingredients together until smooth and set aside. The sauce can be made up to three days in advance and kept covered in the fridge. 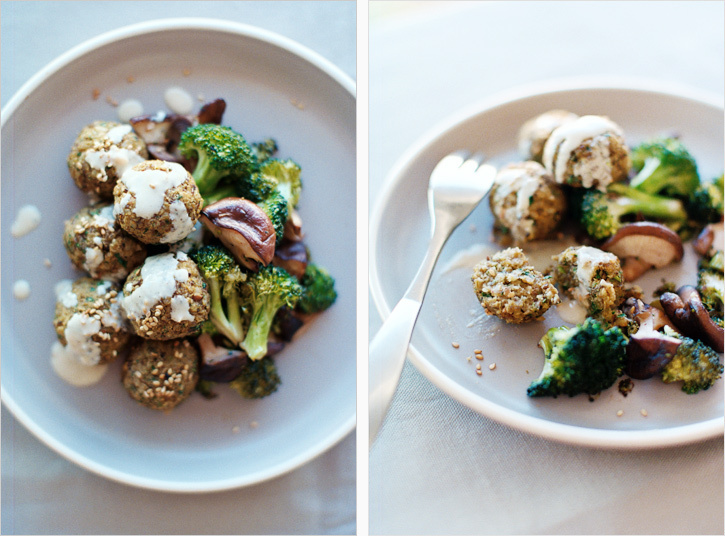 Assemble your meal with a scoop of veggie, some asian nuggets and a generous drizzle of tahini sauce. Besides that I adore it staying light much later, I regret it hasn't felt incredibly summery over here. We have done a few picnics by the beach, my shoulders are tanned and I'm eating my weight in fruit, but I can't say I have felt this season. I think it's easier to see summer with kids or a school schedule, as these three months are marked by a break in routine. Now it's nearly Labor Day, the holiday that reminds us summer is fading, I just now feel called to be more present in this time. Maybe I'm not in school and my work demands carry on just as they did in the spring and winter past, but I want to be here. It's likely not just summer I'm needing to witness, I think it's the curse of the (primarily) self-employed that there is always something to do, which takes away from rest and presence. There is so much wonderfulness to take in if we'll stop and pay attention. I wish I'd stop and pay attention. Luckily September and October are my favorite months around here. Time to suit up and jump in. 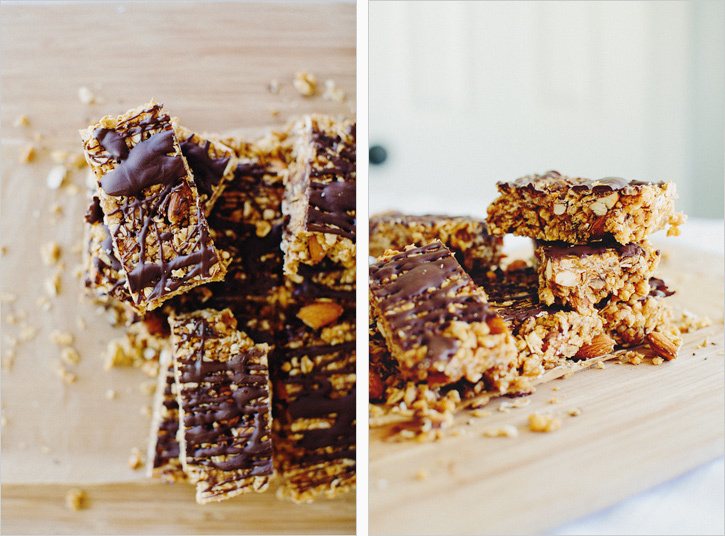 I keep tinkering with granola bar recipes to find just the right texture. Typically, I use brown rice syrup in granola-type bars, but wanted to try the maple route this round. I will say that the rice syrup creates a stickier bar, making everything hold together more easily. The maple is great, but expect the bars to be more loose and fragile. I added a few more dates and peanut butter in the written recipe than the photos reflect so they stay together a bit better. I toast the oats for a little extra favor, but otherwise these guys are no-bake, so they yield a chewier bar, not the crispy shattering sort. You can play around with the nut or seed butter, maybe a different dried fruit besides dates, but it's nice to have a tasty snack for your beach bag or lunch box. I used a 7x11inch dish. Try to use something close, they will be thinner bars in a 9x13 or super thick in an 8x8. Preheat the oven to 350'. 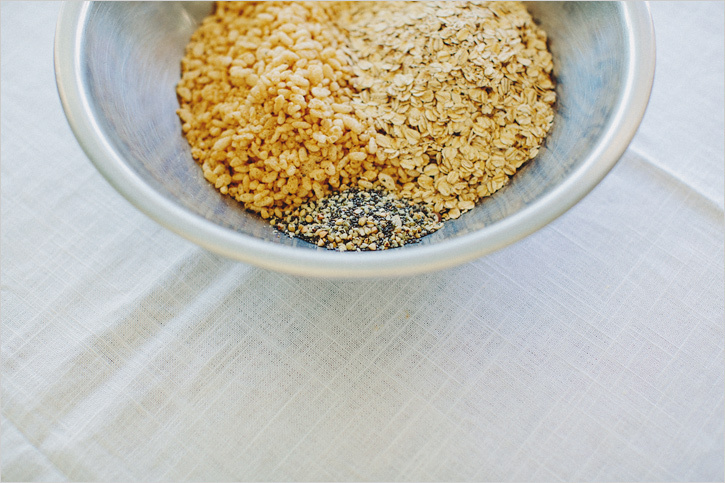 Toast the oats on a baking sheet for 10 minutes. Set aside to cool completely. 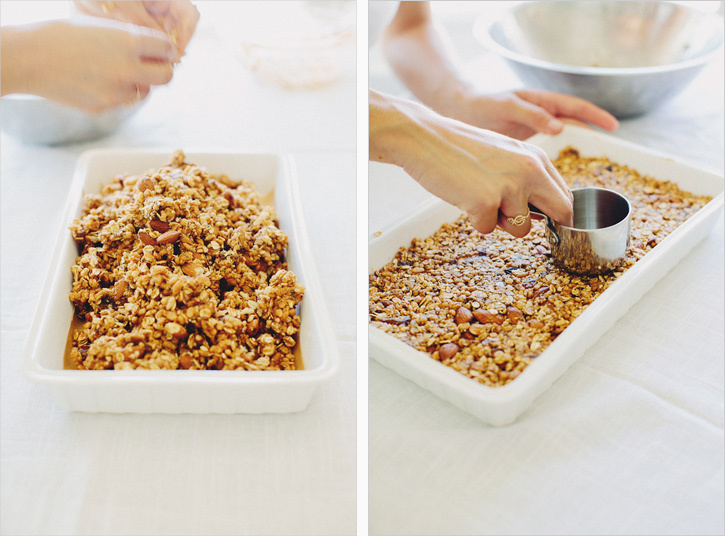 In a large mixing bowl, combine the crisp rice, almonds, seeds, cooled oats and stir to mix. Chop up the dates well to make a chunky paste (this could be done in the food processor but I hate cleaning it for one small task). If your dates seem dry, add a splash of warm water to get them tacky. Think toothpaste sort of texture. Warm the maple, peanut butter, cinnamon, salt and stir to mix. Pour the PB mix and dates over the dry ingredients and mix everything together, breaking up the date clumps with your hands to disperse. Just get your hands dirty, you need a big sticky heap. Line a 7x11inch pan with parchment paper. Press the mixture down in an even layer, using the bottom of something flat to push the mixture down tightly as possible. In a double boiler or a glass bowl over a pot of simmering water, melt the chocolate until smooth. Drizzle the chocolate (or spread it evenly) on top of the bars. Chill in the fridge for one hour before cutting. Keep covered in the fridge for optimum freshness or wrap them individually and store in the freezer. The bars will keep for about 5 days in the fridge. This was my first experience with a pestle and mortar. I envisioned it so earthy and rustic. I wanted to appreciate the fruit of my labor, more so than I would with an electric machine. I borrowed one from a dear friend, to see if this age old tool could stand up to it's reputation. However, the sight of me using all my arm strength to try and break through the fibrous basil leaves was maybe more rustic than I was capable. I felt so pretty, there in the kitchen with Hugh, while chards of garlic were spitting back at me and getting lodged in my curly hair. Super cute. I have read the praises of how much better pesto/pistou turns out with the smashing of the ingredients against the marble. I may loose culinary credibility, but I thought it was a mess and couldn't taste the difference. Go ahead, throw stones. Maybe if I were mega buff, coordinated and more patient, it would have been all it cracked up to be. 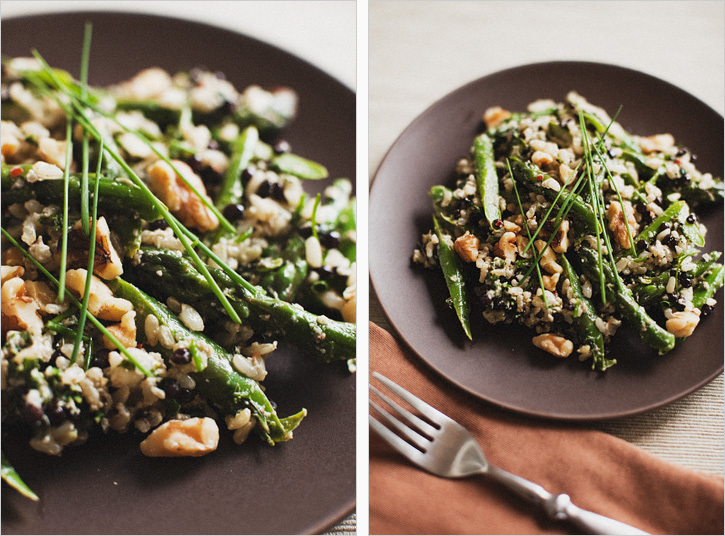 The means of how I got to this warm plate of crunchy green asparagus, rice and lentils is not the point (but haven't I intrigued you to want to get chards of garlic in YOUR hair?). 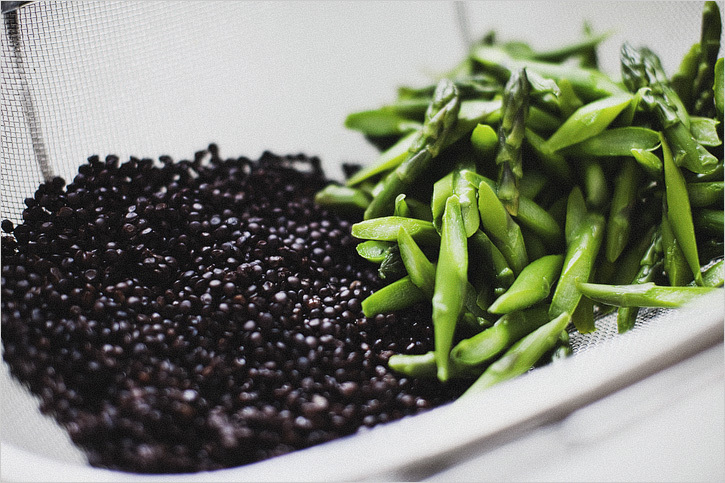 I am partial to adding grains to my vegetables, because it keeps me full longer. This very well could suffice as a simple vegetarian entree, but is also a colorful side. I have sung my song of how I adore leftovers, so I put the chilled reminance over some salad greens the next day. The pistou dressed everything perfectly. The ingredients had marinated overnight, and was just as nice cold as it was warm. It made the garlic scented locks seem worth it. I used a pestle and mortar for the pistou, but it would be less hassle in a blender or food processor. To save yourself time, you may purchase pre cooked brown rice in most freezer sections now. 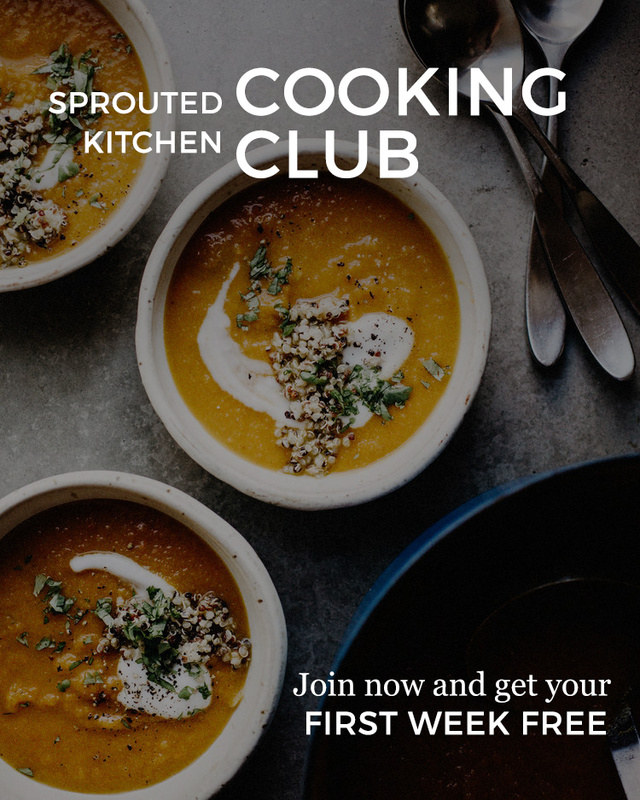 Any variety of lentil is fine, cooking times will vary. 1. In a food processor or blender, add the garlic cloves, salt and walnuts and pulse a few times. Chop or tear the herbs into smaller pieces, and add them to the processor with the lemon juice, pulse until everything is coarsely combined. Add a generous pinch of pepper and red pepper flakes and the extra virgin olive oil. Again, a few more pulses to combine. I like to leave mine a bit chunky. 2. Bring a pot of water to a boil. Cut the asparagus spears on a diagonal, about one inch pieces. Add them to a steamer basket (or to the boiling water, but they will only need about 1.5 minutes here) and steam for about 2.5 minutes. Prepare another bowl of ice water. 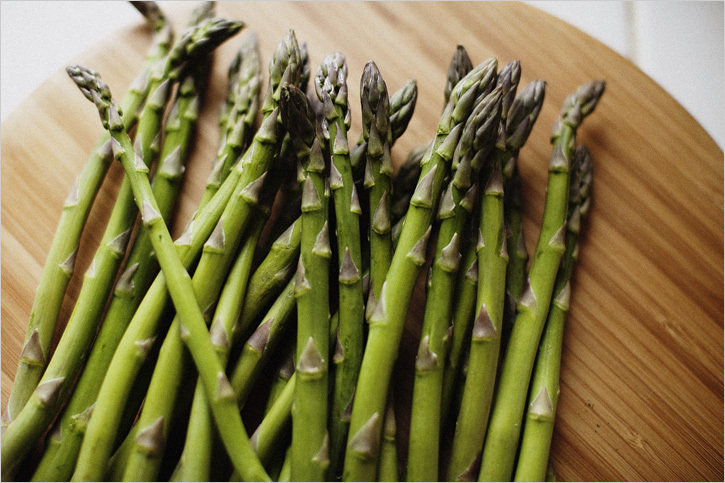 Remove and add the asparagus to the ice water bath to set their color. After a few minutes, drain completely. 3. Prepare the brown rice and lentils according to instructions. While warm, mix them together in a large bowl. Add the asparagus and a few big dollops of the pistou (amount based on personal preference), and fold gently to coat everything in the sauce. Add the chives, fold again. Garnish with fresh chives.